MLK, Jr. Day honors the legacy of an American icon – One of my top ten all-time heroes! Martin Luther King Jr. National Memorial, Washington, D.C. This story has been posted here annually on MLK, Jr. Day since 2009. THIS IS 33RD ANNIVERSARY OF THE ESTABLISHMENT OF THIS WEEKEND THE NATION PAUSES TO REMEMBER THE LEGACY OF DR. MARTIN LUTHER KING, JR.
– “Martin Luther King, Jr. (January 15, 1929 April 4, 1968) was an American clergyman, activist and prominent leader in the African-American civil rights movement. His main legacy was to secure progress on civil rights in the United States, and he has become a human rights icon: King is recognized as a martyr by two Christian churches. A Baptist minister, King became a civil rights activist early in his career. He led the 1955 Montgomery Bus Boycott and helped found the Southern Christian Leadership Conference in 1957, serving as its first president. King’s efforts led to the 1963 March on Washington, where King delivered his “I Have a Dream” speech. There, he raised public consciousness of the civil rights movement and established himself as one of the greatest orators in U.S. history. In 1964, King became the youngest person to receive the Nobel Peace Prize for his work to end racial segregation and racial discrimination through civil disobedience and other non-violent means. By the time of his death in 1968, he had refocused his efforts on ending poverty and opposing the Vietnam War, both from a religious perspective. King was assassinated on April 4, 1968, in Memphis, Tennessee. He was posthumously awarded the Presidential Medal of Freedom in 1977 and Congressional Gold Medal in 2004; Martin Luther King, Jr. Day was established as a U.S. national holiday in 1986,” quoting Wikipedia. – The Seattle Times has a fabulous 2011 expose on the civil rights giant. – The full version of Martin Luther King’s famous “I have a dream” speech. August 28, 1963, posted on YouTube. “Is this a lone wolf in league with foreign sponsors of terrorism? No: This was the life of Martin Luther King Jr. That FBI assessment was dated Aug. 30, 1963—two days after King told our country that he had a dream.,” by Alvaro M. Bedoya, Slate.com. 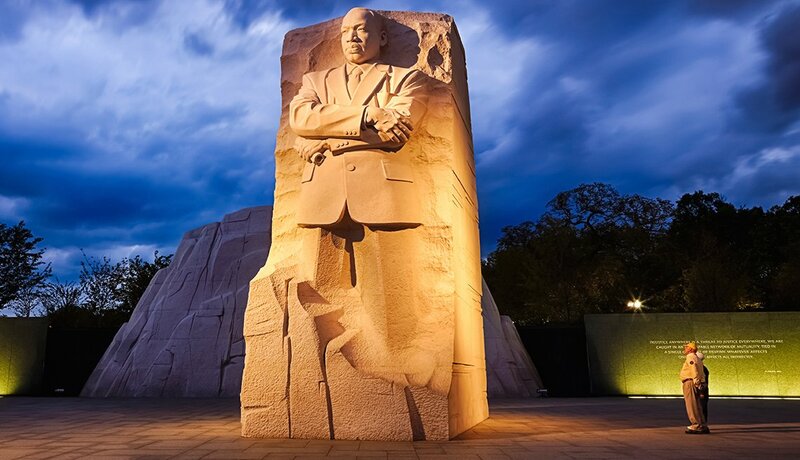 Blogger Klein is a founding donor to the Martin Luther King Jr. National Memorial in Washington, D.C.